The reason this excited me – apart from the sheer elegance of Min-Kyu Choi’s design – was because it took me completely by surprise. Living most of my life in the UK, I have, with 60 million others (and a bit of googling reveals this– from which I learn that this kind of plug is also used in Ireland, Sri Lanka, Bahrain, UAE, Qatar, Yemen, Oman, Cyprus, Malta, Gibraltar, Botswana, Ghana, Hong Kong, Macau, Brunei, Malaysia, Singapore, Indonesia, Bangladesh, Kenya, Uganda, Malawi, Nigeria, Mauritius, Iraq, Kuwait, Tanzania, Zambia and Zimbabwe), been wrestling with our clunky plugs. They’re ok individually, but whenever you try and put them into an ‘adapter block’, you can end up with a rickety and dangerous cluster and sometimes, you just can’t force them together at all! But, like everyone else who has had to use these things, I have just assumed that they were as invariable a part of the world as the clouds in the sky. Crimeny! Those plugs are as big as a hand! My 220 volt washing machine plug here in the States isn’t that big. 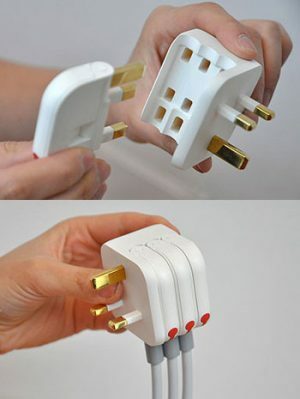 I knew plugs shapes were different all over, but I’d not considered they might also be such different sizes.